Volvo introduced S90 in 1996 to replace the 960 models and the S80 to replace 900 series. 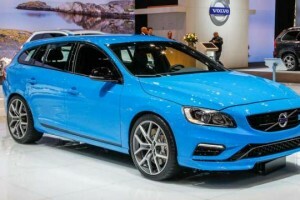 However, after a while, the Swedish car manufacturer decided to stop with the production of S90 and S80 became their range-topping car. 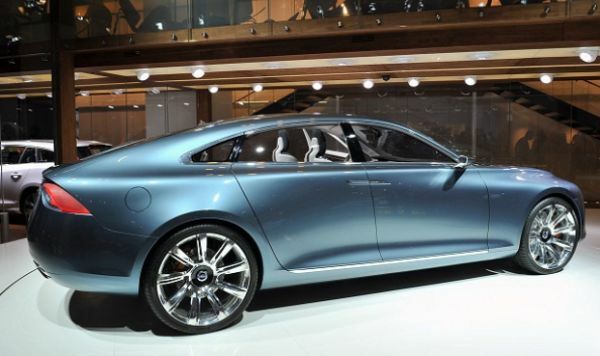 Few months ago rumors started appearing that Volvo plans to bring back the popular S90 and luckily now that rumors are confirmed. 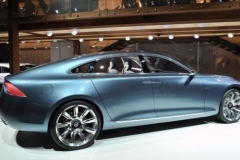 he 2017 Volvo S90 will take back its place and will be a sneak peek into the future that Volvo has in mind. 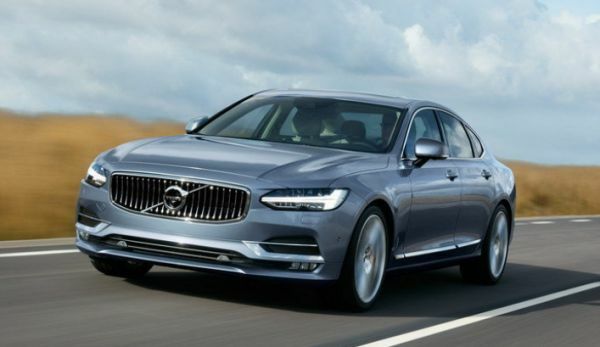 The most interesting detail about the new S90 is that it will come with semi-autonomous Pilot Assist software as part of the base version. 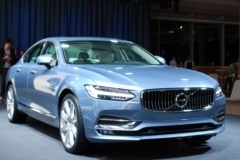 The 2017 Volvo S90 has a completely new design and it is significantly different than its predecessor. 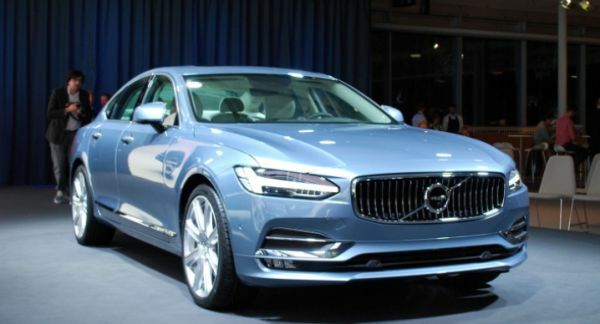 The Swedish manufacturer decided to use the same design language that they used for Volvo XC90 and this design includes new chrome grille with vertical stripes and headlights that have LED daytime running lights in horizontal T-shape (some call this headlights “Thor’s hammer”). The headlights are low and wide, going a little over the fenders. 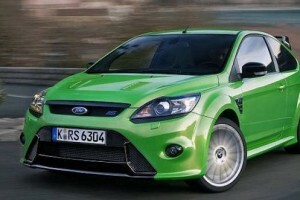 The front bumper is sporty with integrated fog lights and a wide intake. 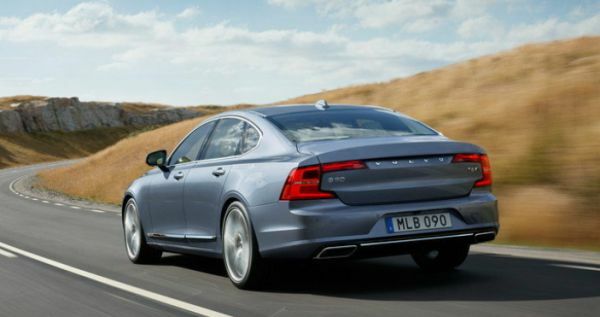 When you take a look at the 2017 Volvo S90 from the side, first thing you notice is the long wheelbase and a sleek profile. 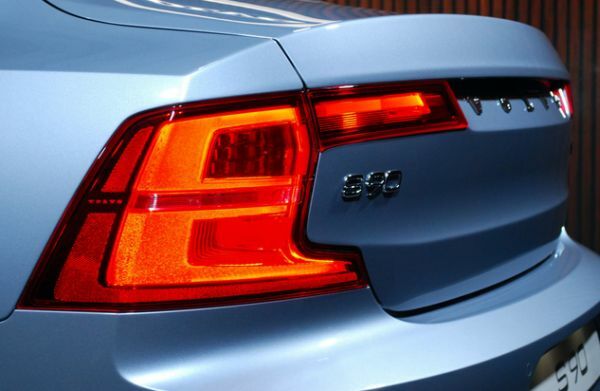 The back of the car has rear bumper similar to those used on Volvo S80, but everything else is brand new – from C-shaped taillights, minimalistic trunk lid (because license plate has been moved to the rear bumper) and large Volvo branding between taillights. 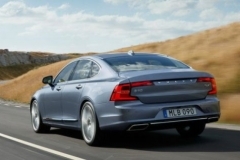 In terms of overall dimensions, the new 2017 Volvo S90 is longer, wider and has a longer wheelbase than its predecessor, however it is still considered to be a mid-size sedan. 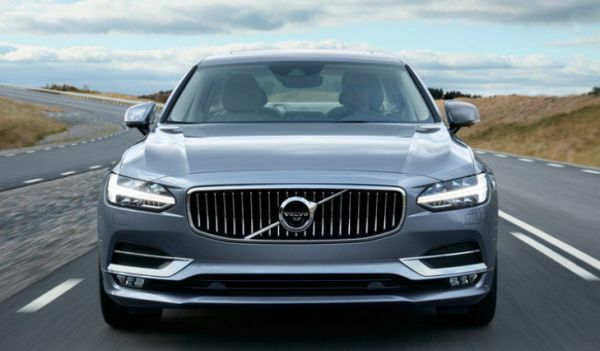 Volvo is known for their stunning design of interiors and the one in the new 2017 Volvo S90 will surely not disappoint you. 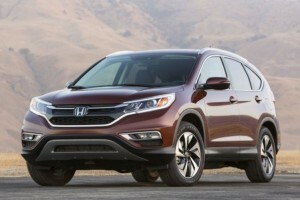 The dashboard comes with an enormous vertically-oriented display which is surrounded by two air vents. The dashboard has much less buttons than what Volvo usually has in their models. 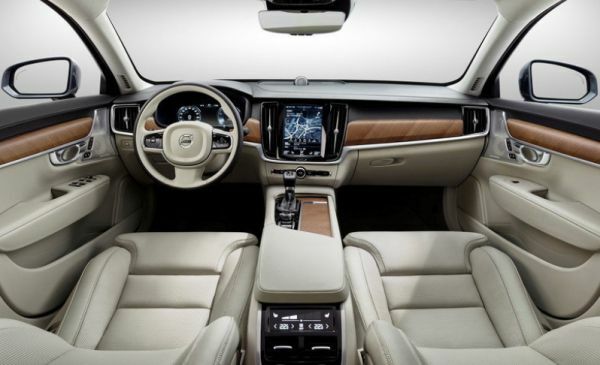 Furthermore, the official images of the cabin of the new 2017 Volvo S90 show a two-tone interior (black and cream colors) with lots of metallic and wooden accents. 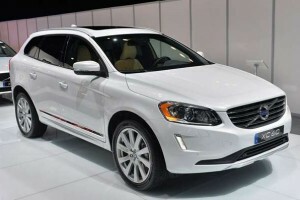 The interesting thing is that the Swedish manufacturer decided to use the same seats, steering wheel and instrument cluster like in the XC90. 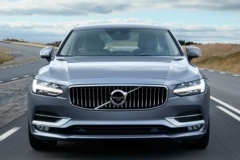 The Swedish manufacturer decided to use the same drivetrains for 2017 Volvo S90 that they use in their other model – XC90. 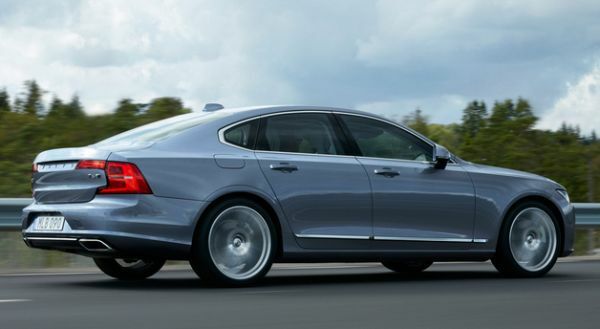 The T5 turbocharged engine produces 254 horsepower and 258 lb-ft of torque. 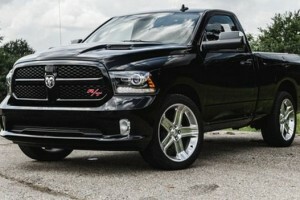 T6 engine generates 316 horsepower and 295 lb-ft of torque. The two diesel units – D4 and D5 are very similar, except for the power output – first produces 195 horsepower and second 225 horsepower. 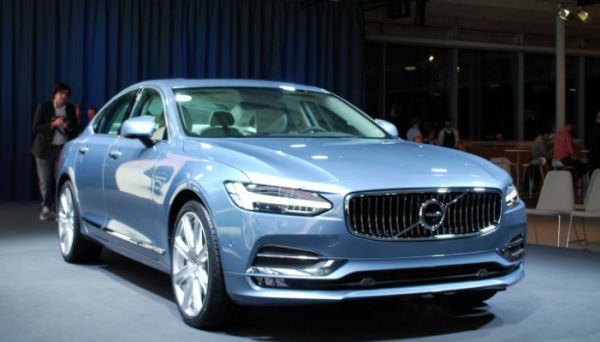 There is no official price of the upcoming 2017 Volvo S90 yet, but experts believe that the base version should start at around $45,000. 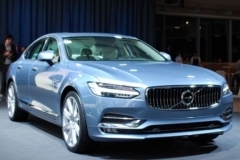 The 2017 Volvo S90 should go on sale in late 2016. 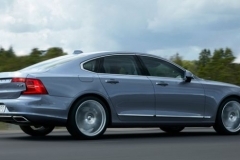 The biggest competitors are: Mercedes-Benz E-Class and BMW 5 Series.